Our high quality In Ground trampoline kit 10ft x 6ft comes with everything you need for easy DIY installation in your own back yard. The smallest of our rectangular trampolines we find this is the perfect for younger children, or where space is limited. It’s rectangular shape is great for fitting neatly into a corner of smaller back yards. 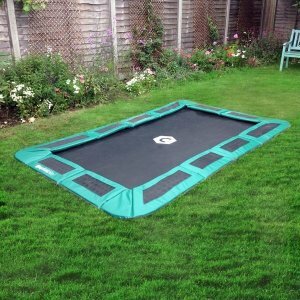 A complete kit – This in-ground trampoline kit 10ft x 6ft comes with the trampoline and pads, purpose built retaining wall (which stops the soil falling back into the hole) and clear instructions. Your net options – The beauty of an in-ground trampoline kit 10ft x 6ft is that you don’t need a net at all! However, we also offer a range of net options, including full, half and quarter nets to suit your needs. Easy to do – Our in-ground trampoline kit 10ft x 6ft are designed to be easily installed yourself. Our website offers some great videos and tips for installation. Step-by-step – through the installation stages of a rectangular Capital In-ground Trampoline. This video is a “must watch” if you are about to install one of our trampolines in your garden. Our team are always on the end of the phone if you need a little help or advice.